Mini-Kus #10: Otso, by Mari Ahokoivu. This story of a bear astronaut takes a highly surprising turn early on. Ahokoivu mixes a friendly, simple line with a green color pencil wash as to astronaut is told to enter "hypersleep" in order to reach his destination in the stars. That's a clever take on hibernation, of course, but what actually happens is a mix of the strange and horrifying. In hyperspace, his ship is overtaken by a trio of bloodthirsty aliens, who attack him for unknown reasons in a series of visceral, orange-stained pages that are surprisingly disturbing. As always, simplicity and suggestion are far more frightening than complexity of image and gore. 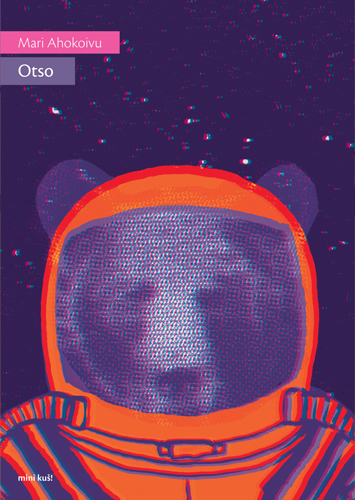 The final twist is that the aliens seemed to be there to help the bear fulfill his mission of being out in the stars, just in a way that was simultaneously terrible, beautiful and poetic. This is another one of those issues of mini-Kus! where the length of the story is perfect for the subject matter, as well as the size of the pages. The reader is given a glimpse into the mysteries of the universe, and all we're allowed to see is what's on these very small, mini-comics sized pages. 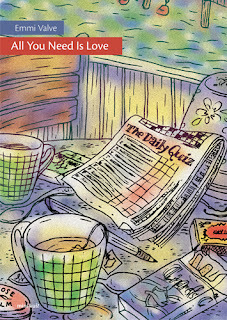 Mini-Kus #11: All You Need Is Love, by Emmi Valve. This is a charming, visually interesting autobio comic that explores relationships and love outside of romance. Valve uses a thick, chunky line for her hand-drawn panels that reflect the rough, spontaneous nature of her drawing. At the same time, within each panel her line is thin enough to detail delicate aspects of her environment as well as provide cross-hatching. Hers is a heavy world, weighed down by depression and expectation. Like many in that state, basic self-care seems entirely impossible. Fortunately, her platonic friend Joakim stops by to give her encouragement, help and a push in the right direction. They bond over the Beatles, coffee and a trivia quiz, as Joakim essentially engages her in opposite action: healthy activities that make her feel better but are the opposite of what her malaise wants her to do. The watercolors in the piece become subtly bright as the story goes on, reflecting the fact that this isn't a cure, but rather a reprieve. The way Valve focuses on specifics in the story is the key to its success; she doesn't try to make any larger points about love, work or success because doing so would rob the story of its personal power. 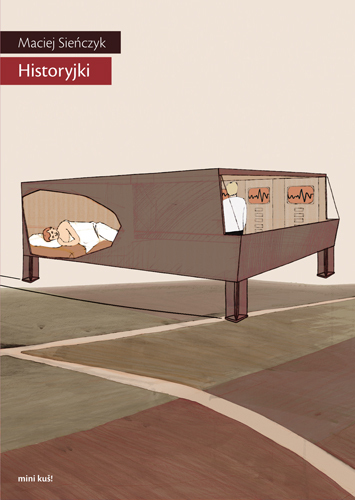 Mini-Kus #12: Historyjki, by Maciej Sienczyk. This mini is like reading an especially strange series of vignettes from Ripley's Believe It Or Not. There's the same straight face in presenting the absurd, the same stiff line, and the same total commitment in telling the story. There's a story of a tribe on a small island, a frightening old man with oversized testicles, and a tribe that travels in a formation the shape of the old man. There's a piece about a song made up during sweeping the floor that becomes an epic about a woman whose bra is stolen off of her when she dies, and how horrible this is. There's a robber foiled by touching a piece of food in a man's mouth shaped like the robber surrendering, tall tales surrounding bread and frightening bread fauns that walk around at night, and the boy who could only survive if kept in boiling water. The latter had to wear a suit like an iron lung/pot-bellied stove but managed to have a wife and children! These stories are remarkably dense but short, packing a treasure trove of false facts in just three or four pages each. The colors are deliberately flat, refusing to betray any sense of sensationalism in these otherwise whacked-out stories, as Sienczyk sticks to his shtick relentlessly.